JJ Snyder and Jason Dinant with KTNV digital check out Mabel's BBQ for National Whiskey Day in Las Vegas. 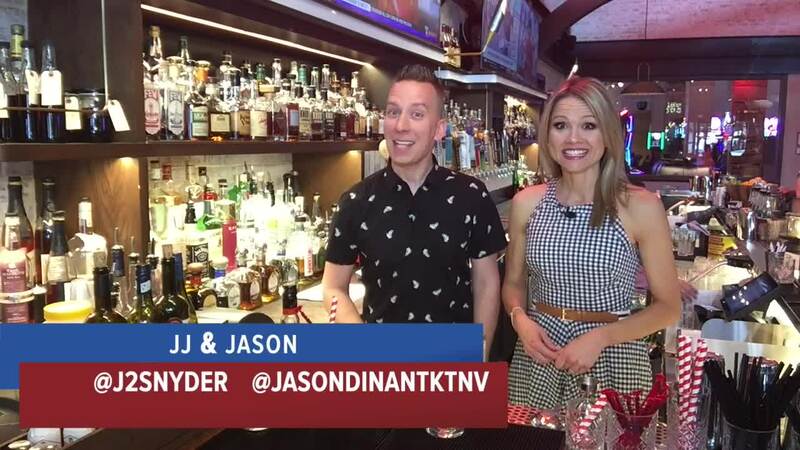 LAS VEGAS (KTNV) — National Whiskey Day is on March 27, here are the places to celebrate in Las Vegas. Mabel's BBQ at the Palms hotel-casino features over 150 bourbons for you to enjoy neat, on the rocks or mixed in a wide range of classic and new cocktails. Celebrate national whiskey day with their new twist on a classic with their french toast Manhattan (see Mabel's BBQ featured in video above). Guests can choose from four variations on the Old Fashioned at Bavette’s Steakhouse & Bar at Park MGM. The quartet are made with four distinctly different spirits, offering a range of flavor profiles. The Old Fashioneds are made with Hibiki – Japan’s most highly awarded blended whisky; Old Overholt – America’s oldest continually maintained brand of whiskey; as well as Hardy Cognac and Belle Meade Bourbon. Big Whiskey's, the brand new restaurant and bar located at Town Square, features over 170 whiskeys. Cheers to National Whiskey Day during their happy hour from 3 to 6:30pm with a signature Big Whiskey's Sour. Delmonico Steakhouse is your one-stop-shop for all things whiskey. Delmonico has been actively building its whiskey library since 2010, and offers guests an unparalleled selection. It includes over 700 whiskey bottlings from countries, including Scotland, Ireland, USA, Canada, Japan, Taiwan, and India. For a classic take on the definitive whiskey cocktail, The Manhattan, guests can head to Tom Colicchio’s Heritage Steak at The Mirage. Their Heritage Manhattan pairs Michter’s Rye with Carpano Antica and is garnished with a hickory-smoked cherry. Presentation is key at Jean Georges Steakhouse at ARIA Resort & Casino. Guests choose their whiskey from a sleek tableside cart that transports an impressive selection of more than 25 spirits including everything from Yamazaki 12 Year to Bunnahabhain XXV 25 Year. Whiskey lovers looking for a little extra pop of flavor can have their spirit smoked at their table. What's better than one kind of whiskey? Three! Head to Lawry's The Prime Rib Las Vegas to enjoy their limited time Irish Whiskey Flight. Available the entire month of March, guests can enjoy a special Irish Whiskey Flight from West Cork Distillery. Whiskeys featured include Bourbon Cask, 10 Year Old Malt and Black Reserve. Iron Chef Masaharu Morimoto celebrates whisky at Morimoto Las Vegas inside MGM Grand with a unique cocktail that blends his passion for opulent meats and Japanese spirits. The Wagyu Manhattan marinates Iwai Japanese whisky with wagyu beef before mixing the spirit with walnut bitters for a one-of-a-kind concoction. Recently winning the number 2 spot for Top Whiskey Bars in The U.S. by Yelp!, Oak & Ivy , located inside Downtown Container Park is ready to celebrate National Whiskey Day. Guests can try two featured cocktails, both of which include Woodford Reserve Bourbon: the Kentucky Mule and Barrel Aged Madame Laveau. At the Oakville Steakhouse inside the Tropicana Las Vegas, patrons can indulge on one of two unique whiskey offerings, the Above The Weather (fresh ginger, lemon juice, Jameson Irish Whiskey) and a good old Knob Creek Rye Old Fashioned (traditional old fashioned with Knob Creek Rye). Who doesn't love a little bacon with their bourbon? Slater's 50/50 Las Vegas is serving up their Maple Bacon Old Fashioned with Jim Beam bacon bourbon, maple syrup and bitters, finished with thick-cut bacon. Talk about celebrating in a sweet way! It's Tea Thyme somewhere! Sparrow + Wolf 's Tea Thyme is the perfect beverage to sip on on Whiskey Day for a fresh taste. The libation features Jameson Black, lemon, earl grey gingery syrup and thyme tincture. Celebrate National Whiskey Day at STK LV with a Manhattan! Not Your Daddy's Manhattan, that is. This sleek and sophisticated whiskey cocktail features Woodford Reserve bourbon whiskey, carpano antica sweet vermouth and bitters. Sip with caution! Whiskey aficionados will enjoy the remarkable selection of more than 50 types of rare and fine American, Canadian, Irish, and Scotch whiskeys as well as hand-crafted cocktails available at Whiskey Down at MGM Grand. Guests looking to sample a variety of options can opt for a whiskey flight.